The Team Fox Young Professionals of NYC are pleased to invite you to the Third Annual Sunday Funday. 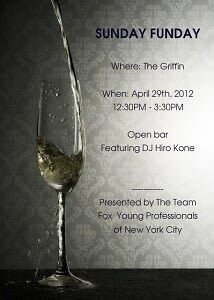 Come support a great cause as you enjoy local NYC food, open bar, and music by DJ Hiro Kone at The Griffin. All proceeds raised will be donated directly to The Michael J. Fox Foundation for Parkinson's Research. Enjoy food from Artichoke Pizza, Frites N Meats, Alma 33, Georgetown Cupcake, Dos Toros Taqueria – just to name a few! Raffle items from David Yurman, Benefit Cosmetics, Yankees, Ralph Lauren, Nars, Hotel Griffou, David Letterman & more. Created in 2009 as a casual and fun way for young professionals to bring their friends and colleagues together to raise both awareness of and support for the work of The Michael J. Fox Foundation for Parkinson's Research, Sunday Funday is a fun afternoon of friends coming together in support of a great cause while enjoying food & drinks, live music, and bidding on exciting raffle and silent auction prizes. Having already engaged over 500 individuals and raised over $22,000 in just two years. To learn more about the Team Fox Young Professionals, click here.